The original incense is sap from the frankincense tree from Somalia. Photo: Karin Martinsson Many trees have sap with a pleasant scent, for example pine and spruce, but have you heard of frankincense, myrrh and balm? These products are known from the Bible and consist of sap from different tree species. Frankincense, myrrh and balm have been used in Europe since the time of the Roman Empire, but still in the 18th century no European knew what tree species produced the sap. Linnaeus’ pupil Peter Forsskål found the balm tree when he was searching for plants of the Bible in Yemen, but he was not allowed to send plants to Linnaeus. The Danish government financed the journey and did absolutely not want any material from the journey to end up in Sweden. Forsskål still managed to slip in a small branch of the balm tree in a letter to Linnaeus who was extremely happy when he received it. The balm tree grows in very dry areas and secretes sap through the bark. The sap is collected, dried and used as medicine or fragrance under the name ”Mecca balm” or ”Balm from Gilead”. The species is named Commiphora gileadensis and belong to the same plant family as the frankincense tree and the myrrh tree, namely the family Burseraceae. During thousands of years sap from trees of this plant family has been collected from areas difficult to access areas and transported to Egypt and Syria by camel caravans. 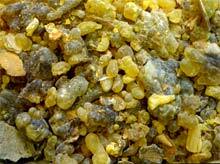 Frankincense and myrrh are still desired commercial goods. These are used in churches, perfume production and in the traditional eastern medicine.